Our designers often use custom fonts to make your project look more beautiful. If you haven’t downloaded and installed these fonts, things will look a little funny! You can find these font files in the “downloads” section of your project. Thankfully it's pretty easy to install fonts. It's as simple as just opening up the font file and pressing install, or on some computers copying the files to a certain folder. You should completely shut down any programs (e.g. PowerPoint) and re-open after installing the fonts. When PowerPoint starts, it'll rebuild its list of fonts. Instructions for Mac and Windows: http://www.fontspring.com/support/installing. To test whether a font has installed and been picked up by a program, select some text and then try to apply the new font. Create a new paragraph of text, then highlight it, open the font drop-down menu, and see if you can find "Lato" (as an example) in the list. Select the new font, and check that the text updates to look different. If it does, the font worked! How do I download my project/where are my files? You can view and download all of the files associated with your project by opening the “Downloads” section in your project. 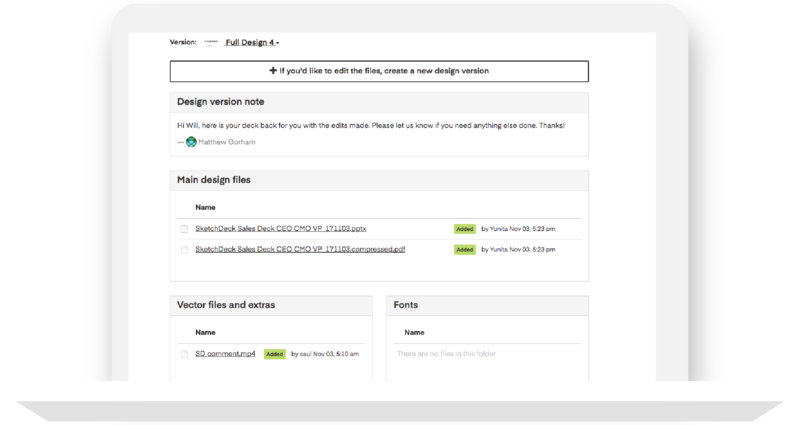 This includes the deliverables you requested in the project brief, a PDF proof of the project, and any custom fonts we might have used.